Working from home means control over your working hours, conditions and life. It’s becoming increasingly popular too, with 70% of people globally working remotely at least once a week. As writing lends itself to remote work, many writers find themselves writing from home. Working from home sounds like a dream – but it’s not without its challenges. From a lack of motivation to unplanned late nights, remote work can become difficult to manage. Here are a few tips for creating a writing-from-home system that works for you. 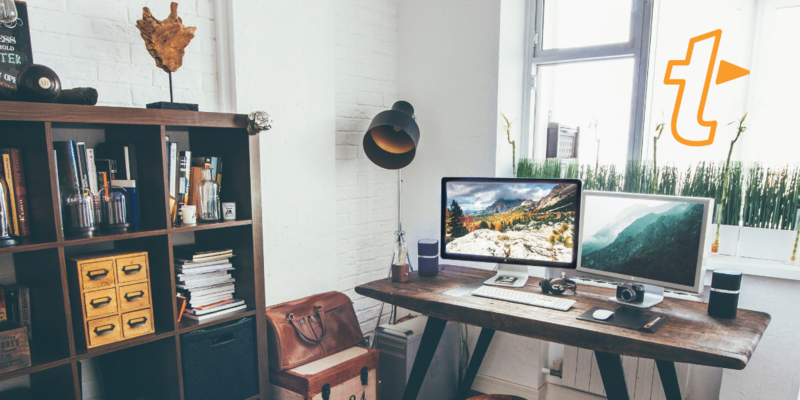 Before you decide to take on a remote working job or project, consider whether remote work is for you. Think about when your best writing happens – is it when you’re alone, or surrounded by people? Do you struggle to get your word count up when you’re at home, or do you thrive knowing your time is yours? These are just some considerations to think about before you start. Once you understand yourself, you can make a plan to address your needs. If you can, separate your work space from your relaxation space. Research shows working from your bed isn’t great for productivity. If you don’t have a spare bedroom, look to other places in your home. Perhaps your kitchen will make a great workspace or maybe your bedroom desk is just fine. You’re also in charge of your working conditions. You can decide whether you set timers, play music, take walks – whatever brings out your best writing. You might find you can’t work to music with lyrics, but you can work to instrumental music. Spend some time getting to know what works. Remember: It’s okay to experiment! Try working in various locations, under various conditions, to see where your best work happens. Some people need the white noise of a coffee shop, for example. But don’t let that limit you, you can get the soundtrack and have coffee shop noises wherever you want. Part of the joy of writing remotely is being able to have spontaneous lunches with friends. Avoid working super late* to make up time by defining your acceptable working window; for example, between 8am and 7pm. This means you can make plans based on whether you’ll have time to get all work complete in your acceptable working hours. *Unless that’s your most productive time. Night owls unite! Whether they are remote or in-house workers, chatting with other writers is a great way to feel closer to those in your industry. This might involve setting aside some “coffee” time with colleagues – or other creatives – on Slack, or simply engaging in conversation with other writers on Twitter or Reddit. The world of social media means you can always find like-minded people, so take advantage of it by finding your writing tribe. Don’t let household chores, passing visits and phone calls distract you. This might mean letting family know you’re not available for spontaneous visits. No matter how much you love them, nothing disrupts a great writing flow like the knocking of relatives at your door. You do work from home, you are going to have people come to your door. But if you don’t have workers scheduled to come by, treat these interrupters like telemarketers and ignore them. If you have a wireless doorbell, you can mute it or unplug it. Your daily steps can take a serious hit when you work from home. Check out this post on staying healthy when you need to sit for hours. It’s an investment – the more you do to avoid aches and pains, the less time you’ll be distracted by ailments in the future. What are your top tips for writing from home? Let us know in our Facebook group.